The first images at Dorothea Lange: Politics of Seeing, now on show at the Oakland Museum of California. 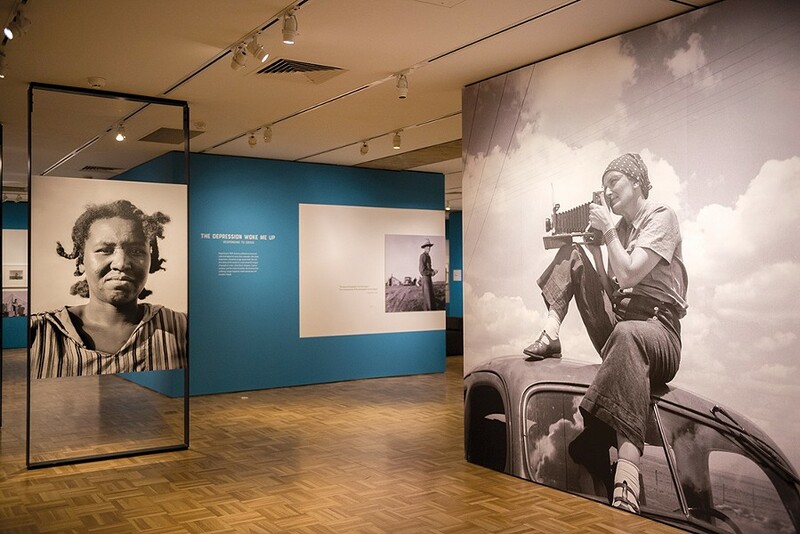 At the entrance of her new exhibition, Dorothea Lange sits atop her car with a polka dot bandana protecting her from the Texan sun, pointing her camera towards something just out of sight. Around the corner, visitors of the photographer’s new retrospective at the Oakland Museum of California, Dorothea Lange: Politics of Seeing, are confronted by one of her subjects. Dressed in a loose shirt, the shadows of a harsh sun carving deep into her features, the sharecropper greets us with a hard stare. The portrait is a bold choice to open the show. She fills the frame, alone and unblinking, her face pitted like soil. And although Lange’s field notes shed little light on the woman’s identity, it’s impossible not to engage. This participation between viewer, photographer, and subject was always Lange’s intention. The world-renowned documentary photographer refused to make work that was a simple record of events. Instead, her voice — and often her outrage — appear in every image, as she travelled the country to photograph the destitute, displaced, and dehumanized. Politics of Seeing divides her formidable body of work into four chronological sections, and includes 130 photographs, vintage prints, unedited proof sheets, and personal memorabilia. The show’s timing celebrates the 50th anniversary of Lange’s gift of her personal archive to the museum. Lange’s connection to the Bay Area is deep. She got her start as a young portrait photographer in San Francisco in 1919 and lived in Berkeley at the time of her death in 1965. Lange found her calling as a documentary photographer almost by accident. Looking out of her downtown studio window one day, she watched unemployed men wandering the city, hungry and aimless. The Great Depression had started to touch her San Francisco neighborhood. She took her camera to the streets, photographing the jobless and homeless, and later worked with the Farm Security Administration to document the lives of tenant farmers in the Jim Crow South and destitute migrants escaping the Dust Bowl. She was meticulous in recording the details of her subjects; their names, ages, and locations, and sometimes included quotes from their conversations. For Lange, photography was always collaboration. “I never steal a photograph,” she told her assistant, Rondale Partridge. “Never.” Her desire was to show things as they really were while ensuring the dignity of her subjects. Though she was drawn to document suffering, she understood she was a trespasser in others’ misery. She felt she had a duty to respect the shared humanity between photographer and subject. For exhibition curator Drew Johnson, this collaborative approach is “the source of her greatness.” She never asked her subjects to meet the camera alone. As artist and activist, Lange hoped her images would wound. Their emotional intensity had the power to affect citizens and lawmakers, and she believed that showing the world how others suffered would bring about change. “The camera is a powerful instrument for saying to the world, this is the way it is. Look at it,” she said in a documentary made by her granddaughter, also screening in the exhibition. Indeed, her work for the FSA did reach the government and help improve conditions for migrants. But Lange also subverted many of her FSA assignments to photograph the truth of America’s corners. Sent to record the lives of white farmers in the segregated south, Lange turned her camera instead to the Black sharecroppers who lived under tyranny. When Japanese-Americans were ripped from their homes and sent to internment camps during World War II, Lange’s images were so clearly critical that they were censored. She was, Johnson recalled, the first of the FSA photographers to be fired whenever funds became scarce. Yet, she persisted. 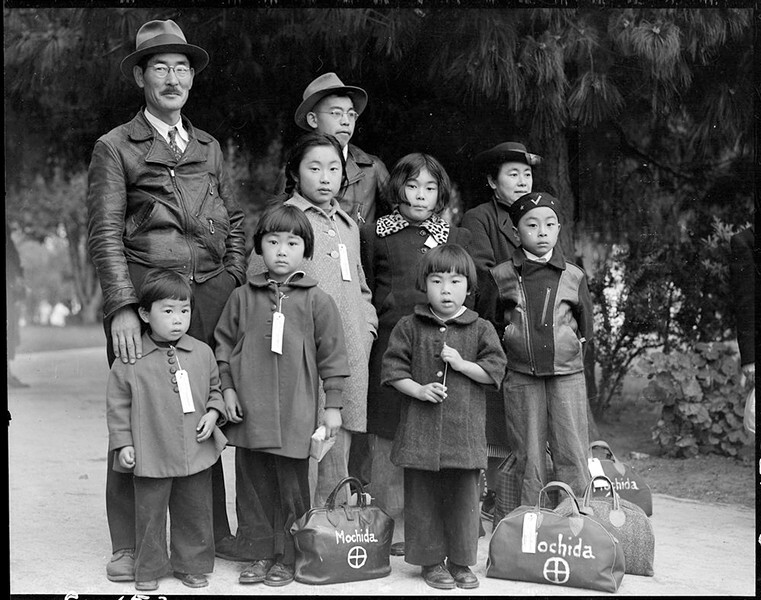 Members of the Mochida family awaiting a removal bus. Identification tags were used to aid in keeping the family unit intact during all phases of removal. May 8, 1942, Hayward, California. Lange’s activism is present not only in what she photographed, but in how she photographed. Her choices in framing and cropping were often radical — some images were cut so tightly only the subject’s clasped hands are left visible. Editing the sequence of her pictures was a painstaking process, as she looked for the right narrative. At Politics of Seeing, visitors have the chance to try cropping and sequencing some of Lange’s photographs, as well as examine the way her editors sometimes changed her stories. Recent anxiety about “fake news” and media literacy make these interactive activities particularly timely. Today each of us has a camera in our pocket. We are inundated with images. And yet, Lange’s photographs still cut through the noise. In front of the images of Japanese-American internment camps, visitors have been talking about Trump’s Muslim ban. “People are constantly bringing it up,” Johnson said. The photographs cast a shadow on modern America, reminding us what this country is capable of. And yet the work she accomplished still resonates today, in a new era of resistance. Looking at her photographs, we remember the importance of standing together and engaging with one another’s stories and struggles. Collaboration, as Johnson said, was the heart of Lange’s life as a photographer. We do not meet these experiences alone. Dorothea Lange: Politics of Seeing is on view at 1000 Oak St, through August 13. Free–$19.95. MuseumCA.org.